I used some of my Gingham Garden Designer Washi Tape and a little strip of Blushing Bride dsp to add a little color. 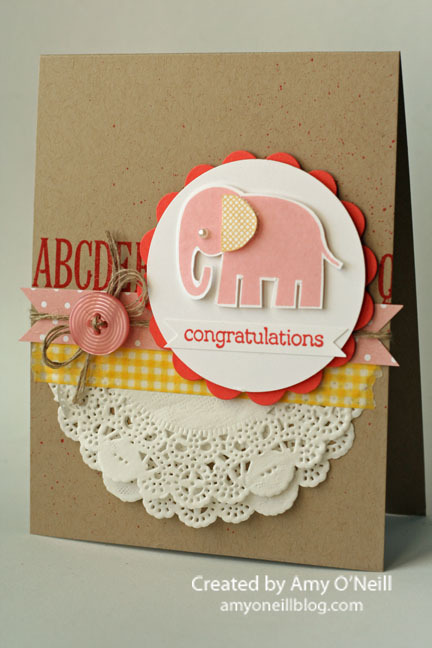 And I stamped the Alpha wheel with Calypso Coral ink on the card base. I really need to remember to use my wheels more. I have some that I really love. The scallop circle comes from the Perfect Pennants Bigz Die. I love how it works with the 2-1/2″ Circle punch. This entry was posted in Zoo Babies. Bookmark the permalink. Very cute! I love the color combo & the splash of red. I couldn’t just pass by this without commenting… “Wow!” In every way! This is art. Total sweetness! This is adorable! So cute! Love the button detail. 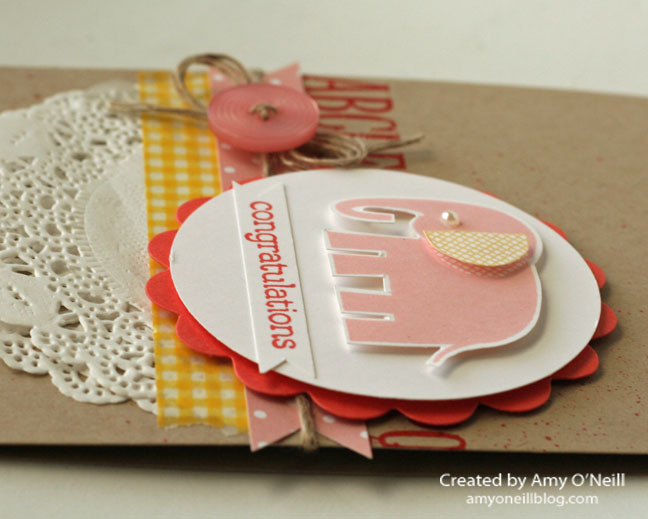 Just wondering…did you hand cut the elephant? This is such a beautiful card! Yes, I did. I just used my paper snips. Framelits for this stamp set would be a great idea, wouldn’t they? Yes, they would! I had hoped you found one since it was cut so perfectly! This is too, too cute, Amy! Such a fab layout!